Number system is the foundation of CAT quantitative aptitude section. Often, students start their preparation of CAT quantitative aptitude from the number system. 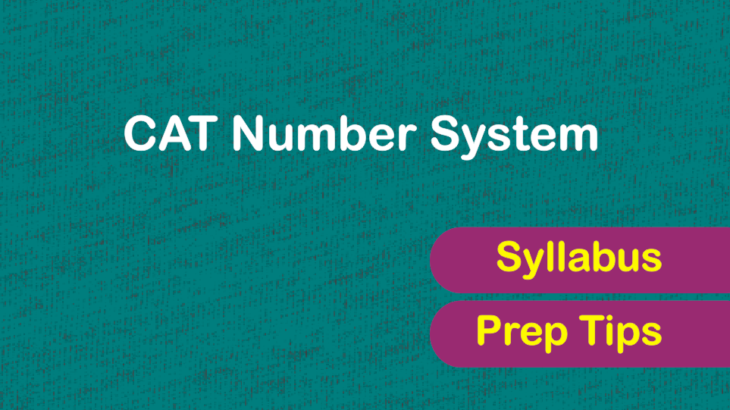 In this article, we will discuss the syllabus of number system for CAT exam followed by how to prepare for number system. 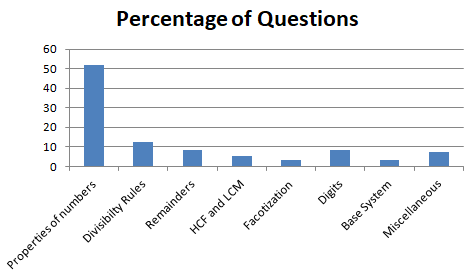 Below is a bar graph which shows the percentages of questions subtopic-wise from Number system which have appeared in CAT Exam between 2000 to 2008. We can see that more than 50% of the questions are from the properties of numbers. It is also advisable to keep the order of preparation of number system topic as given above, i.e., the very first thing you should be doing is to understand the properties of numbers, which must be followed by divisibility rules and then factorization and so forth till you reach Base System. There is no limit to the number of concepts for the CAT number system, to the variety and the difficulty level of questions. So, it is a challenge for an average student to decide which all concepts are essential to prepare concerning CAT exam and which all concepts he can ignore. Let me assist you in identifying the fundamental concepts within these sub-topics which are vital in your CAT number system preparation. Within this, one should focus on the fundamental properties of prime numbers, co-prime numbers, perfect square, decimals, and fractions. In CAT and other MBA entrance exams, problems based on the properties of prime numbers frequently appear. Most of these questions are solved by just putting the initial few prime numbers like 2, 3, 5, etc. Apart from this, a critical prime number related concept that every prime number greater than 3 can be written in the form of 6k + 1 or 6k-1 has been very handy in solving some complex questions based on prime numbers. Some time back I took a youtube session on properties of numbers. In this video, I have discussed in length on how and to prepare in properties of numbers. Here is the recorded video of the session. A student must be familiar with all the divisibility rules of numbers from 2 to 13. Although, also there may be a question that demands the divisibility rule of a number greater than 13. However, in such problems, the number can be factorized into smaller numbers which are within the range of 2 to 13. Thus we can apply the concept of divisibility rules of the factors of the number one after another to get the final answer. Question: If the number x3458623y is divisible by 88, what is the value of x? Here we can see that 88=8×11. So we can apply the divisibility rule of 8 and 11 one by one to get two equations having x and y as the variable, and on solving those two equations, we can get the corresponding value of x. Similarly, we can also solve cat questions based on divisibility by 1001. It is important to note here that 1001 = 7x11x13. Again, we can apply the divisibility rule of 7, 11 and 13 to solve the question. A student must be very comfortable in prime factorizing of any three digits or four digit composite numbers. So far we haven’t come across a question in which we get the answer just by prime factorization. However, prime factorization is often the very first step in solving many problems which are based on HCF LCM, and integral solutions. Prime factorization is also crucial in solving some of the logical reasoning questions which are based on splitting the numbers. The number of factors of specific kind of a composite number. Like: the number of factors which are divisible by 3 but not by 6. Application of factorization in solving questions related to integral solutions. HCF and LCM is yet another very important subtopic of the number system. A decent variety of questions are framed from HCF and LCM. The concept of LCM is also used as an alternate approach in many questions from the area of arithmetic like work and time and time speed and distance. Consequently, quickly getting the LCM of two or more numbers is very important. A student should restrict himself to solving remainder questions which are purely based on the basics of reminders. Elementary knowledge of Euler theorem and Fermat theorem and their applications in finding remainder are quite handy. However, the problems based on remainder not only appear from number system but also from algebra. Thankfully, the theme of solving questions from both these areas remain same. At times, fundamental expansion of algebraic expressions like a^n + b^n and a^n-b^n are also helpful in solving problems from reminders. CAUTION: We have observed that many students waste lots of time in solving tough and abstruse questions from remainders. I again emphasize on restricting oneself to solving only simple problems. Remember, in CAT exams, conceptual and straightforward questions are asked. Remember, you are preparing for CAT exam and not for International Mathematics Olympiad. A simple concept of cyclicity is sufficient enough to solve questions which are based on finding the unit digit. Occasionally, questions based on last two digits have appeared in competitive exams. These questions too have been conceptual and straightforward. For students who know Binomial Expansion may consider using the binomial expansion in getting the last two digits. Aspirants who are not from mathematics background or have difficulty in understanding mathematics or are not having that much time to get into the depth of every topic can safely keep this topic out of their priority. The preparation starts with the understanding of the properties of numbers followed by the topics as illustrated above in that order. After going through the concept of each of those topics, one should solve simple problems based on the topics, and then one should move to questions which are of an advanced level and require multiple concepts or multiple properties to answer them. Past year CAT questions on number system are one of the excellent sources for moderate to advanced level questions. Wherever possible the student must also go through the derivation of the critical formulas or concepts. The derivation is also essential because it helps us to understand the concept in depth. At times, if there is a slight variation in the question, then it allows students to do the needful manipulation to get to the answer. Students must consider the derivation as an integral part of their CAT preparation. 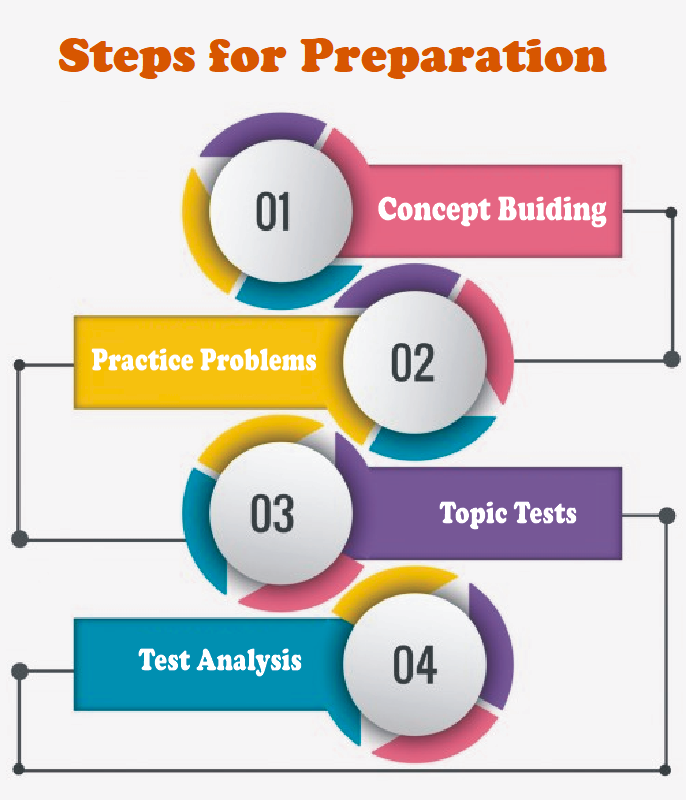 This step is meant to test the students’ competency and increase his confidence. For this, the aspirant should take topic wise tests and check if they can apply the concepts and handle the variations in the questions. Everyone makes silly mistakes. Keep a note of those silly mistakes and consciously try to avoid those in the next test. One of the best ways to avoid silly mistakes is to scan the question again before marking the option. This approach is tested and proven way to avoid many silly mistakes. For example, many a time question from geometry asks us to find the diameter of the circle. In solving such questions, often we find the radius of the circle. Students, then immediately mark the option which is the radius of the circle and not the diameter. Had the student scanned the question again before marking the options, he will immediately rectify his mistake. If you have solved a question and got it wrong, you must always check the possible reasons. Few of the reasons could be calculation error, misinterpretation of the problem, silly mistakes, or conceptual error. The first three reasons can be addressed easily. But if you have made a conceptual error, then you should take it seriously and should go back to the theory to rectify it. Many a time you will come across solutions of some questions in which we have new concepts or shortcut formulas. You must not feel demotivated that how would you come to know that we have to apply such a concept or shortcut trick; instead I would suggest that you should learn those tricks or concepts. My final advice would be to focus only on the concept and to solve elementary questions which required multiple concepts of the number system. Don’t waste your time in solving very tough questions which keep on circulating over the internet. Remember that the chances of very tough questions appearing in CAT exams are slim and if they do appear, then the probability of getting them right is very low. Your prime objective is to get good percentile in quant section of CAT and not to fall into a trap of solving the tough question, thereby wasting time. Blog, Exam Preparation number system. permalink.